Boys and girls...what a wounderful band!!!!! "Missing"is proposed with a special emphasis, while the new version of "Whisper" is harder and very good arranged. The song listed here as "Tourniquet" is actually a cover of "My Tourniquet" by Soul Embraced, and is another fantastic song, while from the bottom of the heart comes...."Hello", one special ballade. 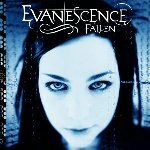 The Piano is used in many songs....and the melodies are perfect, Evanescence have understood that the atmospheres and Amy's voice are their strength and even if there no technicalism there's a special groove in all of these songs........what may i say?..we have to wait, this album will be out on 3.4.2003!!! !BUY OR DIE!!!!!! !